Social franchising is increasingly being considered across a range of sectors (such as health care and education), as a strategy for taking social programmes to scale and for increasing their social impact. Like commercial franchises, a social franchise provides access to an existing and successful model of service delivery, it provides initial training and ongoing support to service providers, and it drives a demand for services by linking the service to a strong and identifiable brand. 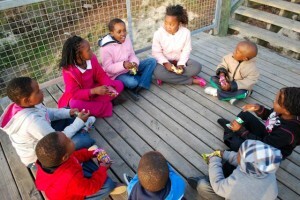 In South Africa, people working in the area of provision of Early Childhood Development (ECD) services are increasingly beginning to explore the idea of using a social franchise model to scale-up ECD provision, and as a model for inspiring the public, and parents in particular, to recognise and expect high quality ECD for their children. As this idea begins to take shape, we will, in the coming months, be exploring the perspectives on social franchising of people working in or contributing to the ECD sector. Over time, we hope to develop a deeper understanding of the broader vision and unfolding strategy, as well as an appreciation for the opportunity and challenges that social franchising – in the South African ECD context – presents. Scale-up of ECD services in South Africa… requires greater economies of scale, greater consistency of training and services, and greater public recognition of the importance of children’s earliest years. Social franchising is…a way to inspire the public, and parents in particular, to recognise and expect high quality ECD services for their children, while at the same time achieving higher service standards and economies of scale. Sustainability can be achieved by… developing a high-quality, visible national franchise that will attract government, foundations and corporate funding. Focus on a fantastic franchise, and the sustainability will follow. Scale-up of ECD services in South Africa…is critical if we are to reach the large numbers of children, especially those who live in poverty, who currently do not have access to those essential services they need that will be enabling of their development and healthy life-course. Much of the service provision delivery of this kind of scale will have to be carried by civil society organisations. It is no secret that these organisations have done fabulous work in their communities, some beyond, but their work tends to be in pockets, unfortunately, pockets albeit of excellence, won’t achieve scale. What we have to do is build on this expertise and promising endeavor to develop tools that will train many more practitioners, up-skill the sector, put more programmes and services on the ground, based on better planning and population coverage with increased quality! It’s a tall order but one we have to find a way to deliver on, we need innovations that will make quick wins possible. Social franchising is… potentially a game changer in a segmented sector engaged in scattershot provision. Developing a mechanism which will provide the tools, the management system and the training will certainly be enabling, it will also draw interest to ECD and if managed effectively, with buy in from the right stakeholders, including government, could be one way of getting services to children of quality at scale, quickly. Attention should be given to… readiness of the system for take up (the system being government and civil society). This means beginning to build the capacity of civil society organisations now so when the work has been done and the tools for a social franchise model for ECD developed, organisations are ready to hit the ground running. The same applies to preparing government stakeholders so that they too are prepared, open minded and ready to partner with organisations to give the social franchise route the best chance possible of impact! I have questions/concerns around… the capacity of the sector to take up and run with a social franchise model. The Ilifa RTO survey shows a small sector, under strain, concerned about its survival. While they have shown great resilience and keen interest in franchising, there is need for the sector to organise itself and for champions to provide vision, capacity building and mentorship that is enabling of significant growth. Part of this growth will be drawing new practitioners to the sector, developing plans based on the population (needs and context) to ensure coverage. We cannot assume that a social franchise model won’t just lead to more of what we already have, other things need to happen that enable shifts in the sector so they are fit for take up and delivery of quality.